Anomalia :: February 16 – May 18, 2012 :: Opening: February 16; 5:30 – 8:30 pm :: University Art Gallery, UCSD, 9500 Gilman Drive, La Jolla, California. Anomalia features four international contemporary artists whose work engages scientific models of research and representation. Charles Gaines, Erick Meyenberg, Erick Beltrán, and Jorge Satorre employ empirical systems in their practice, including ethnographic data research, cognitive modeling, and systems theory. Anomalia is curated by distinguished independent curator Lucía Sanromán specifically for the UAG and the UCSD campus. The word Anomalia is the Latin root for anomaly and refers to a deviation from the norm. The title references the oppositional intersection between art’s subjective and speculative methodologies and the empirical analysis and objective systems of knowledge required of the sciences. The relationship between art and science have been studied and explored in various ways for decades, and recent discussion has specially focused on positioning art practice itself as a form of scientific research. In contrast, Anomalia takes a new approach by closely investigating diagrammatic and systematic forms of representation that reveal the constructed nature of both art and science and their mutual investment in the notion of the sublime. The celebrated conceptual artist and CalArts professor Charles Gaines is featured in the exhibition and his work provides an important theoretical and historical context to the younger artists. The exhibition presents two bodies of work Gaines created in the early 1980s, Landscape: Assorted Trees with Regressions (1981), and Numbers & Trees V (1989). These series investigate the role that systems play in the creation of form and of aesthetic phenomena. Implicit to them is a questioning of the means by which images are read, understood and experienced. By responding to a predetermined numerical structure, rather than to his own subjective desires and needs, the artist proposes that concepts such as beauty and order are learned rather than implicit to the artistic object. Utilizing LED lights, music and physical space, Erick Meyenberg presents a four-dimensional diagram of the genetic coding of Mexicans, from the Colonial period through today. 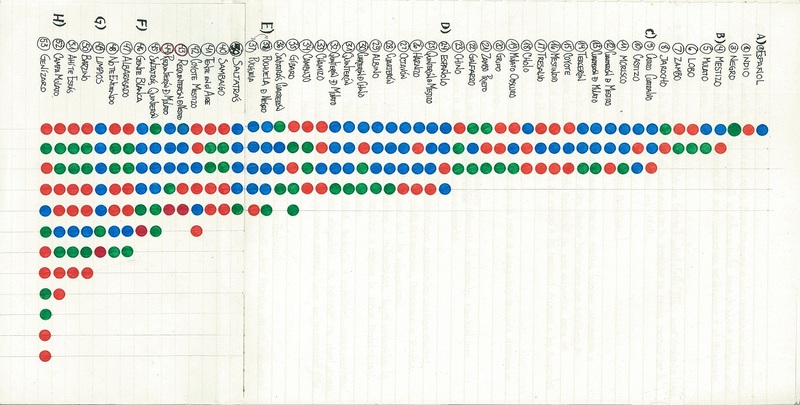 Using 22 individuals as subjects, Meyenberg calculated the percentage of indigenous, white, and black blood in each individual to create a three-dimensional genetic diagram. By plotting these findings the artist generates an immersive colored light and sound installation that is a symbolic reflection of the socio-economical structure that prevails in Mexico and other countries. The artist has made a new site-conditioned version of Étude taxonomique-comparative entre les Castes de la Nouvelle Espagne et celles du Mexique Contemporain in response to the interior architecture of the UAG. Shifting to cognitive science and its history, Beltrán and Satorre work collaboratively on a long-term project titled Modeling Standard that takes as a departure point the theory of the “Standard Model” in particle Physics that states that everything is made of twelve fundamental particles. Beltrán and Satorre appropriate this model to create a subjective, multi-narrative, illustrated micro-history that presents key moments and characters from cognitive science, psychoanalysis, art history and literature, including Carlo Ginzburg and Fantomas, among many others. Anomalia features new material created in response to a special interview between the artists and renowned UCSD neuroscientist Vilayanur Subramanian Ramachandran, the Director of the Center for Brain and Cognition at UCSD. Anomalia features four contemporary artists whose work is fueled by concepts derived from scientific research and who utilize scientific representations and conventions in their work, but remain embedded in aesthetic phenomenology. The exhibition suggests that by bringing together science with aesthetics, both orders are interrupted. Accordingly, the exhibit both questions scientific positivism and exposes the conceptual underpinnings of aesthetic rapture.